Any Questions or Looking For a Quote? One of our long term customers contacted us in Mid-January with a requirement to increase their production capability - in a hurry! We built a pair of Mini-Fill MKIII machines, with hot fill specification, side mounted to accept product direct from their mixing tank. From order to delivery in just 14 days our customer was able to satisfy their uptake in orders. 'We received the new depositors on Friday. We have now installed and are ready for action tomorrow at 6.00am. Thank-you for your speedy manufacture and delivery of these depositors. We are proud to end 2018 with our newly launched Mini-Fill MKIV depositor. The machine represents a leap forward in terms of product flow, simplicity in strip-down & hygiene, with reduced ownership costs. Shown are 2 quantity 4 outlet Mini-Fill MKIV depositor units to be used over an indexing conveyor system to offer in excess of 240 fills per minute & offering fill-complete control. We wish all of our customers a very Happy Christmas & a prosperous New Year! Manufactured & installed depositing equipment for liquids & solids, both hot & cold fill. Manufactured & installed packaging handling equipment. 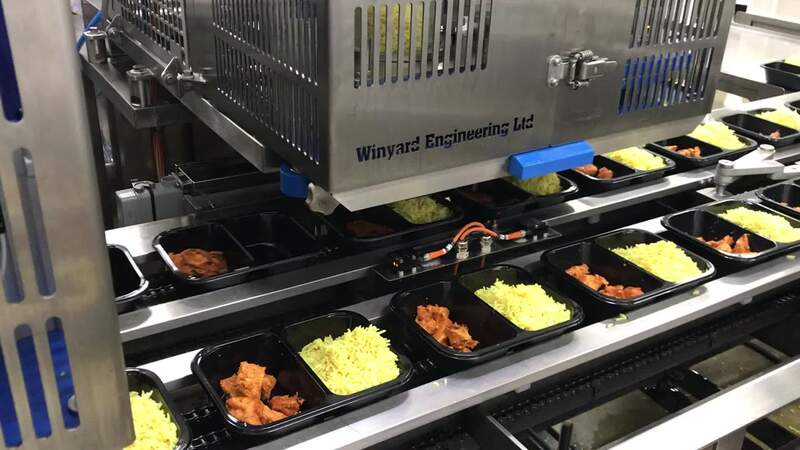 Manufactured & installed vegetable preparation equipment. Provided breakdown, repair & spares service. With a relationship over 30 years plus. Designed, manufactured & installed bespoke filling equipment for hot filling applications. Manufactured & installed packaging handling equipment. Provided bespoke manufacturing service. Provided long-term rental machinery at short notice. Manufactured & installed vegetable preparation machinery. Designed & manufactured specialist vegetable cutting equipment. Worked closely over many years automating the bakery production process. Manufactured & installed numerous depositing solutions. Maintained & serviced machinery on a planned schedule. Manufactured & installed depositing equipment. Manufactured & installed bespoke machine guarding. Provided an out-of-hours breakdown & repair service when necessary.